Well, well, well, look who came by to hang out a little with us. It’s been a long time since we first met the Galaxy S II at the MWC 2011 earlier this year, and now the time has come for the Samsung Galaxy S II to be properly previewed away from all the hustle and bustle. Naturally, being the replacement for the well-known Samsung i9000 Galaxy S, the Galaxy S II has to fit the very large shoes of its predecessor. And judging by the initial impressions from quickly playing around with the device – it does pretty well. The user interface is ridiculously snappy and the phone, despite its mammoth size, feels alive and light. And why wouldn’t it? 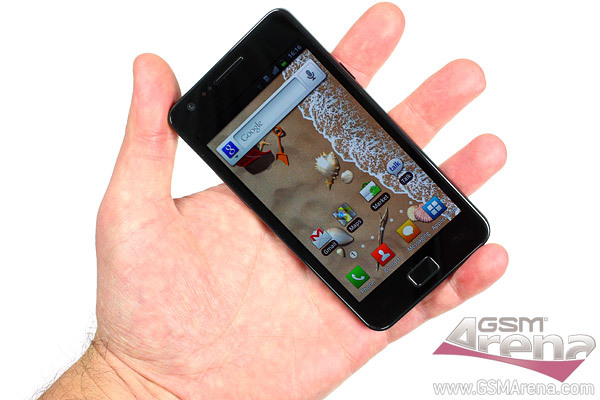 Packing a 4.3-inch Super AMOLED Plus screen the Galaxy S II weighs just 116 grams, and while this may sound a lot, for a device this size, it’s quite an achievement. Speaking of achievements, the Samsung Galaxy S II is 8.5mm thin, which, just for a comparison, is 0.7mm thinner than the LG Optimus Black and 0.8mm thinner than the iPhone 4. Yikes! But the Samsung Galaxy S II is not all show and no go. We’ve got a pre-release unit on our hands and despite strong indications that the retail version will run at 1.2GHz, our Galaxy S II is clocked at 1GHz. Graphics and video performance is dealt by a Mali 400 GPU and 1GB of RAM to help everything run smoothly. All this means some freakishly serious performance. And just to give you a taste of what kind of performance we are talking about, we’ve prepared a short video of the Galaxy S II playing a 720p HD YouTube video straight within the stock Android browser. Pretty awesome, eh? Don’t worry, we are as excited and as eager as you guys are to get this preview ready for you. In the meantime, don’t forget to drop us a line what you think of the phone in the comments below.